← Internet Rumor Control: Epic KaBoom! 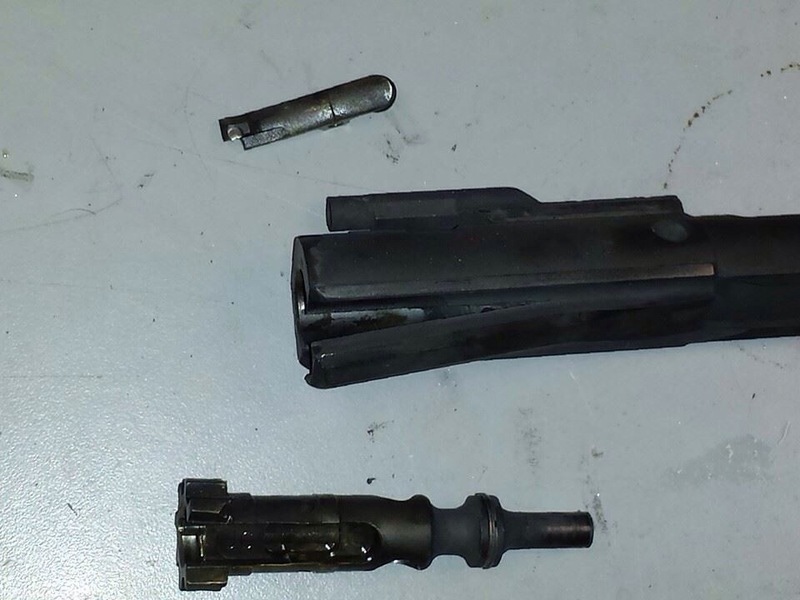 I’ve heard of people accidentally clambering .300 Blackout in .223 chambers before and seen the photos. It’s often as simple as someone picking a round up off the range between drills and not recognizing it as .300 then mixing it into a mag with .223. With a bolt action it would be pretty hard to chamber .300 Blackout into a .223 barrel. In a semiauto, with the bolt slamming forward the projectile can be pushed back into the casing allowing the bolt to close. This week it happened to one of my friends, John Brooks. Here’s his post from Facebook. “IF YOU ARE A SHOOTER, A RELOADER OR KNOW ONE, I NEED YOU TO READ THIS PLEASE. On December 31st, 2014, there was a very real opportunity for me to either be killed or very seriously injured. We had been shooting all day testing out some of our new 308s. While we were finishing up our brass call and cleanup, I realized I brought one of our suppressed 10.5” 5.56mm machineguns to test fire. I had already packed up all our ammo, so I borrowed a mag from another shooter that was “clearly” full of 5.56. Since it was suppressed and we were already done for the day and packed up, I got lazy and decided to not pull my eyepro and earpro back out from their cases. So I fired a few rounds in semi, everything seemed good, so I switched to auto. Braaap, braaap, braaaBOOOM! Catastrophic detonation. I was deaf, disoriented and in a semi state of shock. If any of you have been hit by a flashbang you know exactly what I am talking about. I quickly checked myself for new holes and made sure both eyes still worked. My right ear had shut off and the ringer was off the hook. 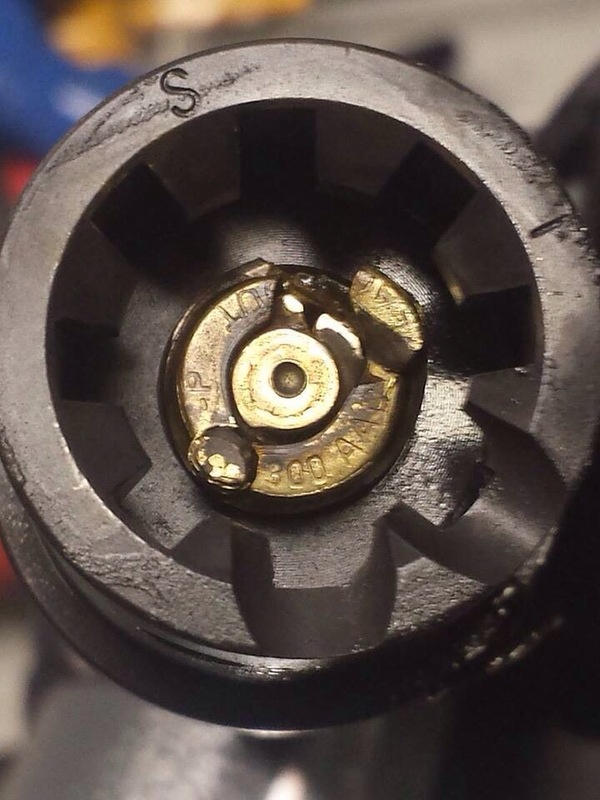 Unbeknownst to me, there was a 300 BLK round hidden in the mag. It most certainly chambered fully, and the crazy thing is the barrel was clear and there were no baffle strikes on the can. 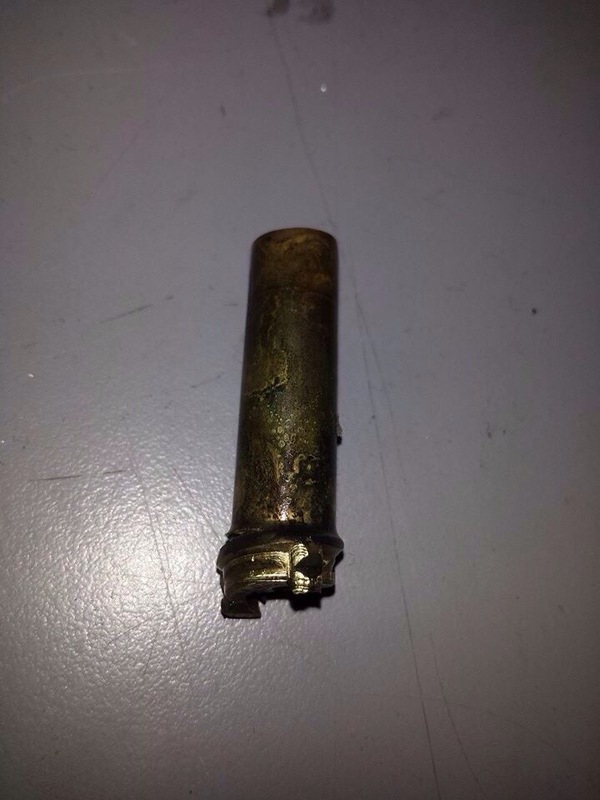 So a 30 caliber bullet squeezed itself down to .22 and made a 10.5″ high pressure journey and exited and made it all the way through a YHM can. This most likely saved my life. If the barrel was any longer, I’m sure it would have found a new place to deposit gas; most likely right into my idiot face. The upper receiver bulged out, the carrier split longways and the remaining contents of the magazine were launched out at my feet at Mach 2. I walked away from this (somewhat) unscathed. I was very very lucky because this could have gone a lot worse. If you own both .223 and .300 blackout rifles take care not to mix up mags or ammo. It would make sense to not have both calibers on the range at the same time. This entry was posted in Gear, Industry Insiders. Bookmark the permalink.